David Bowie on the Serious Moonlight tour of 1983. THE WARNING signs were there, though it is only in retrospect we see and recognise them. Having dominated the 1970s as the decade's key artistic innovator and trendsetter, Bowie was prepared to admit that the following decade may not be quite so productive. "I don't have the urge to continue as a songwriter and performer in terms of experimentation - at this moment," he told the NME's Chris Bohn. The end of Scary Monsters (and Super Creeps ) had said the same in more symbolic fashion, with the sound of a cassette tape furiously unravelling. Yet all this seemed false modesty. Bowie was getting the 1980s off to a great start. Scary Monsters was an artistic and commercial triumph, positioning the artist as father of the New Wave and New Romantic movements, and pointing the way towards to what would become indie and alternative-rock; a No 1 hit single with Queen in 'Under Pressure' followed in 1981; as did the acclaimed Baal EP of Bertolt Brecht songs a year later. Then, in 1983, came Let's Dance. As this 11 CD/15 LP strong box set shows, it would be the last victory in a difficult decade for the Dame. Recorded with Chic's Nile Rodgers, Let's Dance (4/5 ) was a step away from the experimental run from Low to Scary Monsters, fusing instead a more accessible hybrid of pop-rock, dance, and soul, summed up by the exuberant gospel-esque swing and drive of the opening track 'Modern Love'. Yet for all it's slick playing, production, and pop smarts, Let's Dance is a serious, at times dark album. 'Modern Love' subverts its gospel stylings with declarations of "Church on time/Terrifies me" and "God and men/don't believe in modern love". The monumental title track, one of Bowie's greatest songs, imagines a last dance against the backdrop of the Cold War and nuclear annihilation: "Let's dance, for fear from grace should fall/Let's dance, for fear tonight is all", while the sublime 'China Girl' is disturbingly more relevant in 2018 than it was in 1983: "I stumble into town/just like a sacred cow/visions of swastikas in my head/plans for everyone." Mention should also be made of Stevie Ray Vaughan's marvellous, blues based guitar work throughout. Let's Dance turned Bowie, already a stadium-filling superstar, into an even bigger stadium-filling superstar. Yet, it was during the accompanying Serious Moonlight tour, that Bowie, looking out at the vast audiences flocking to his concerts, had a realisation: "I wondered how many Velvet Underground albums these people have in their record collections?' I suddenly felt very apart from my audience. And it was depressing, because I didn't know what they wanted." That confusion and loss of confidence would bring to an end his early 1980's triumphs and see Bowie stumble through the rest of the decade. 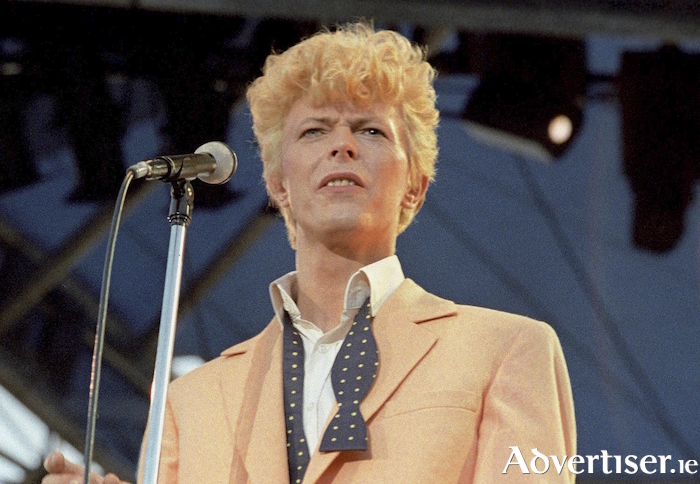 Serious Moonlight (3/5 ), recorded during that tour, captures Bowie in that period of uncertainty. A number of the performances (eg, '"Heroes"' ) sound as though he's toning down his music in order to go easy on his new audience, yet, on 'Life On Mars?' and 'Station To Station' he is thrilling, uncompromising, while the full-bodied version of 'White Light/White Heat' is possibly his best ever take on the Lou Reed composition. It was with 1984's Tonight (2/5 ) that Bowie's artistic crises became apparent. In terms of production and professionalism, the album is flawless. The problem is Bowie had very little new material, so he padded out the album with a bloodless, unimaginative take on The Beach Boy's 'God Only Knows', and the resurrection of Iggy Pop co-writes 'Tonight' and 'Neighbourhood Threat', neither of which matched the passion and menace Bowie and Iggy cooked up for the original versions on Lust For Life (1977 ). Worse still, on 'Don't Look Down', he sounded like a cross between Steely Dan (who split in 1980 ) and The Police (who had issued their final album the year before ). Bowie was now following old trends instead of leading new ones. Things hardly improved with 1987's Never Let Me Down (2/5 ). Despite energetic opening track 'Day-In-Day-Out', the prog-pop silliness of 'Glass Spider', and the riff-rocking ''87 and Cry', Bowie sounds indistinguishable from any number of eighties rockers - how far he had fallen. The subsequent Glass Spider tour is represented here by a live concert from Montreal (1/5 ), and begins with a version of 'Up The Hill Backwards' where Bowie tries (and fails ) to sound like Prince. The show was conceived as a theatre piece, but the interactions with the dancers/actors are now very dated and rather cringe inducing. Given that Bowie told the NME in 1986: "I don't have the riveting desire now to persuade people that what I have to say is right", all of this becomes understandable. Yet, if Bowie's albums were below bar, the man was still able to issue brilliant singles, as collected in the Re:Call 4 (4/5 ) disc of this box set. Here is the grandstanding majesty of 'Absolute Beginners', showcasing Bowie's vocals powers to stunning effect; the understated 'Loving The Alien', which again sees Bowie taking a critical look at religion ("believing the strangest things/loving the alien" ); the brilliant hit single 'Blue Jean'; that fun duet with Mick Jagger on 'Dancing In The Street (and who can forget its 'so atrociously bad, it's brilliant' video? ); and as a real treat, there are Bowie's songs from Labyrinth, with the sinister pop of 'Dance Magic Dance' sounding as good as ever, and 'Underground' ripe for reclamation as a overlooked Bowie gem. Still, we could have been spared the super ripe fromage of Bowie's campy take on the 1958 Italian Eurovision entry, 'Volare'. Bowie had weathered the storm, just about, and as the 1990s beckoned he would begin to find his way back via hard rock and electronica, but that's a story for the next box set.